Students are always burdened with the expectation of parents and teachers. Preferably, this expectation is responsible for stress among several students. Fear of negative remarks and embarrassment of having low grades can drive them towards the negativity. Although, students have to understand that unexpected scores cannot raise a question towards their abilities. They should not be disappointed. These are the part of human life in which everything comes with inherent positives and negatives. People should learn to manage their expectations because most of the problems in our surroundings backed up by the unnecessary expectations. Students are determined about certain grades in the exam, but become disappointed while they do not score as per the expectations. They should learn from this experience. There are many students who have to face the same situations. Handling the negativity is not an inherent trait; indeed, it has obtained through a process that anybody can learn. The role of family, school teachers and is extremely important for preventing the negative effects of examinations. They should not condescend in insulting comments. Emotional help work as a powerful weapon at this time and confidence enlightens the hope of better score next time. Moreover, there could be uncontrollable situations or other factors behind the low grades. Instead of spending time in penitence, they should have some fun with family and friends. Have faith in your skills and abilities and polish them in order to face future challenges. Analyze your current position and prepare for the next exams. The mistakes that you have done in the past are the strong experience from which you can learn about what to do next. You should not allow anyone to let down your morale. If you accept the past and look forward with the hope, you could achieve what you want. Be confident in what you are doing in the present. A problem is only a medium to introduce you with your mistakes. Rectify them and stand up with the new determination. Students Assignment Help is an online firm, Which provides academic help for students of the school, college and universities. We have the team of expert assignment helpers from UK, USA and Australia. StudentsAssignmentHelp.com is here to bring smiles to students faces by helping them to meet their family and friends expectations of high grades and also help them to attain their goals in an easy yet affordable manner. We help students to enjoy their college and school life by getting their assignment and essays done in perfect manner, so they can easily specnd their time with family and friends and also spend their precious time in getting their hobbies done. 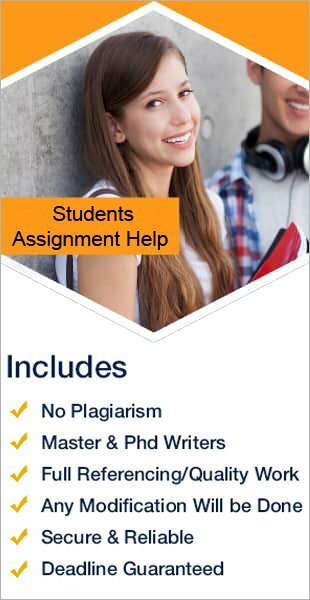 So, if you are facing issues to meet your family expectations of high grades and unable to get your assignment done on time and with accuracy then you can avail the assignment help, essay help, do my assignment services provided by the experts academic writers.